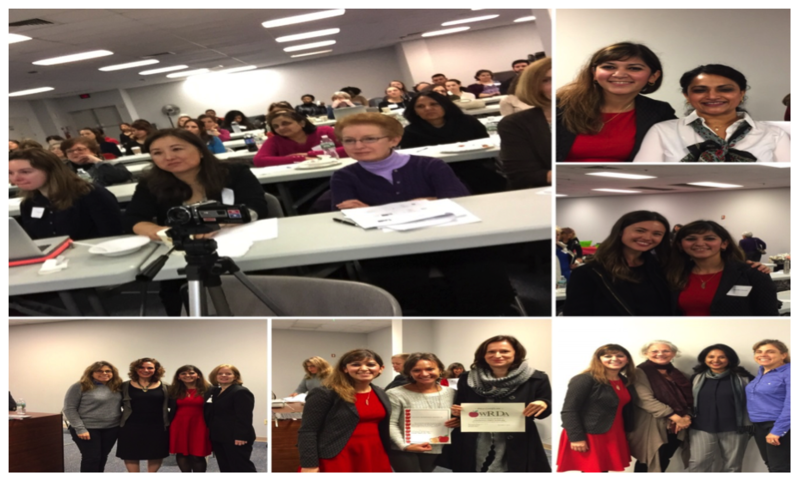 WRDA CLINICAL UPDATE 2017 - "An Ounce of Prevention ... Food for Healthy Living"
The Westchester Rockland Dietetic Association’s (WRDA) annual clinical update was on December 7, 2017. Around 100 nutrition professionals attended this year, including Registered Dietitian Nutritionists (RDN), Dietetic Technicians, Registered (DTR), and nutrition students. This year, the clinical update focused on disease prevention “An Ounce of Prevention…Food for Healthy Living”. To start the event off, Niharika Jaiswal, WRDA’s President gave the opening remarks. Next, Diana Monaco, NYSAND’s Immediate Past President spoke about getting involved in the Academy of Nutrition and Dietetics and the New York chapter, NYSAND. It was then time to begin the presentations. Kathleen Ryan and Melissa Keeney, WRDA’s Co-Presidents Elect provided the biographies and introductions for each speaker. A mid-morning highlight to this year’s update was a Public Policy Update by Ann Darcy. Each speaker this year presented innovative ways that nutrition professionals can assist their clients to live healthfully. Andrea Canada discussed current food trends and how an RDN can add value and a health sustainability focus to a foodservice operation. Mary Beth Augustine discussed the microbiome, including the evidence for medical nutrition therapy and a risk characterization framework for clinical decision making. She also discussed emerging research topics regarding nutrition, healthcare, and the microbiome. Jeanne Petrucci and Julie Harrington discussed ways to engage clients with culinary nutrition, and how to grow your business by offering culinary nutrition program. They then provided us with a food demo and samples while discussing how the audience can incorporate this concept into their own practice. Lauren Graf discussed the role of plant- based diets in managing cardiovascular disease, diabetes, and chronic kidney disease. She shared some remarkable patient stories. A huge thank you to our raffle sponsors. The WRDA raised $340 at the meeting through the raffle. Diana Monaco won the Capri Beauty gift certificate, Abby Walker won the cookbooks and Field Goods coupon, Roberta Gershner won attendance to next year’s Clinical Update, Terry Schlanger won next year’s WRDA Membership, Niharika Jaiswal won the gift certificate to Rouge Tomate, Jennifer Sukhdeo won the 2nd Century Initiative basket, and Ellen Pospishil won the PAC basket. Thank you to all those who participated in the raffle! A big thank you to our generous product sponsors this year, including Peanut Butter & Co, Harvest Snaps, Purely Elizabeth, Biena Snacks, JCC of Rockland, Celebrate Vitamins, KIND, Manitoba Harvest, Shoprite, Once Again, and Kite Hill. Like us on Facebook and check us on Instagram to follow our page for photos, recipes, and information regarding events! Over 50% of colorectal cancers are preventable through a healthy lifestyle (including diet choices). Elisa Bremner, WRDA President, Janice Shaw, NYSAND AME Chairperson, and Melissa Keeney, WRDA Nominating Chair took time out of their Sunday morning to help cheer on the runners at CCCF's fun run/walk at Manhattanville College. 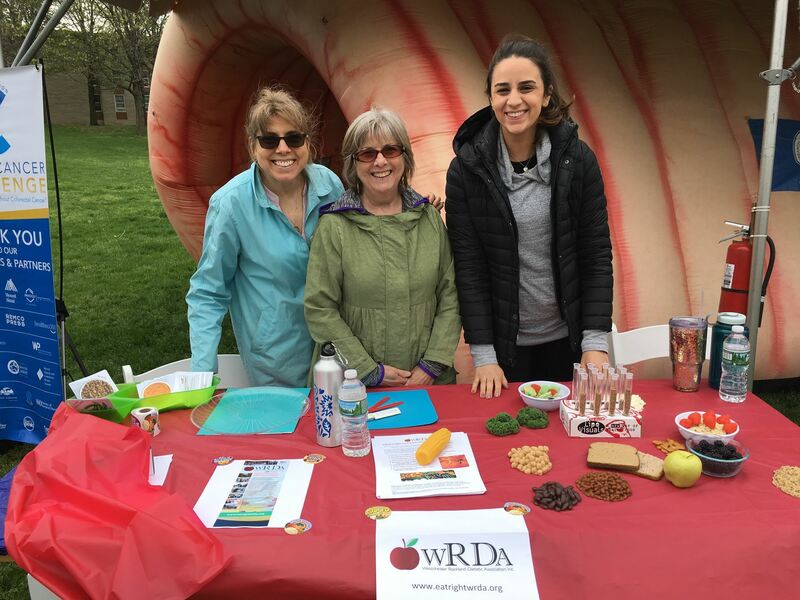 WRDA provided nutritional guidance and a delicious colon-cancer-busting snack of hummus & veggie wraps (that pink thing in the background is a giant inflatable colon). We hope this will be the start of many more event where WRDA members can get out our message to the public. The WRDA Clinical Update occurred on December 1, 2016 at Palisades Center. Around 70 medical professionals including Registered Dietitians, Dietetic Interns, Diet Tech students attended the Clinical Update. This year the Clinical Update focused on "Mindful Perspectives on Nutrition & Aging". There was a wide array of presentations focusing on the continuum of the aging process, management of Alzheimer's disease, usefulness of meditation therapy, nutrition therapy in the Aging process. The opening speech was given by WRDA President Elisa Bremner, followed by the information on NYSAND Centennial AME by Janice Shaw. Niharika Jaiswal, President-elect, provided an overview of the Clinical Update. Columbia University College of Physicians and Surgeon, Department of Medicine/ Division of Geriatric Medicine and Aging. Dr. Thomas provided an excellent overview and in depth of understanding of the human physiology on the complex topics of aging, end of life, palliative and hospice care, which are clinically relevant to members of the healthcare team providing nutritional care to their patients. Speaker, Hollie Webb, provided cutting edge information on the different treatments utilized for the management of Alzheimer’s disease. In addition, participants were given an opportunity to partake in a meditation session under the guidance of Supriya Reddy. The final segment of the Clinical Update comprised of a presentation by Miriam Pappo, on understanding the nutritional aspect of the aging process followed by a panel session along with Jennifer Flood-Sukhdeo. There was a Q&A session where the participants were able to ask nutrition questions to the panelists. During the Clinical Update, a session by Ms. Ann Darcy and Ms. Catherine Foley provided an update on public policy on nutrition related topics. The Clinical Update finished with drawing of two raffle prize winners Sylvia Hawkins, and Antonella Caggiano receiving the WRDA membership for the year 2017. The WRDA kickoff dinner occurred at The Rye Bar and Grill on Wednesday September 16. Over 30 members attended with at least half of attendees being new members. Several people walked in so there was a great turn out! Attendees schmoozed and networked over appetizers, wine and beverages for about a half hour before the presentation. The speaker was Dr. Elizabeth Wind who led an interactive presentation on mindful eating. Participants were engrossed in a discussion and were given tools to add to their counseling toolbox. A delicious three course dinner followed where participants were seated in a lovely room with tables of about 6 people. Janice Shaw also gave a short plug for the AME which will take place at the Doubletree in Tarrytown in May. We look forward to seeing you at our October event on "Fearless eating for children" with Jill Castle at Phelps! Our March 29th meeting was a tremendous success! Thank you to all who attended the meeting. The WRDA prouded over $700 as a donation to the Food Bank of Westchester! Thank you to our speakers. Please visit their websites and consider becoming a member of their Community Supported Agriculture (CSA)- Farm Share Program! 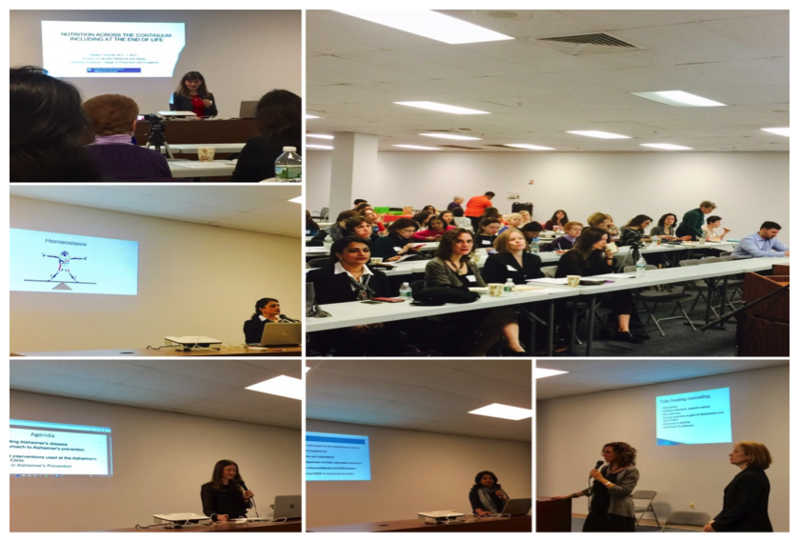 The WRDA held their Annual Clinical Update meeting, “Gut Health from Beginning to End,” on Thursday, December 5th, 2013 at the Palisades Center in West Nyack, NY. With nearly 100 RD’s in attendance, the meeting was a huge success. Assemblywoman Ellen Jaffe, A NYS Sponsor for Licensure A7316, kicked off the meeting with opening remarks.